Indianapolis Self Storage at 8040 Georgetown Rd. Located just north of the intersection of Georgetown Rd. 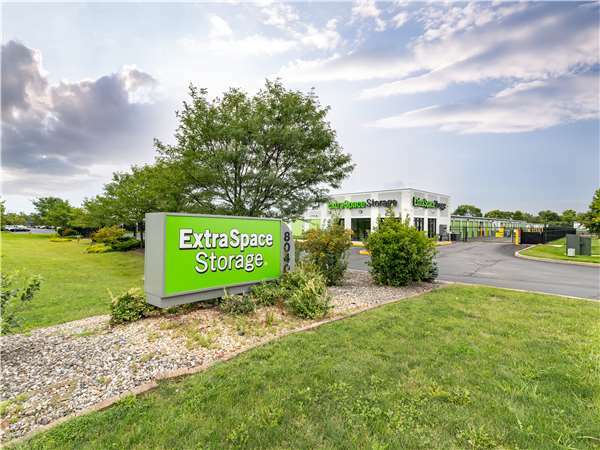 and W. 79th St., Extra Space Storage serves Indianapolis residents near Westover, New Augusta, Bridgefield, and more. Locals will recognize our facility a few minutes north of Westbury Court Apartments and Conagra. We're also accessible for residents of nearby apartments, such as Crooked Creek Apartments, Westbury Court Apartments, and Oak Lake. Extra Space Storage on Georgetown Rd. offers a variety of storage units, climate-controlled storage, and vehicle storage. We're the solution for you in Indianapolis! Our Indianapolis storage facility has storage unit sizes from 5x5 to 11x44 with features like indoor access, drive-up access, and more. We can handle practically any residential or commercial need you have! With security access to your floor only, an on-site manager, electronic gate access, and 24-hour video surveillance, our Georgetown Rd. storage facility provides the secure environment you want. With climate control, your unit stays comfortably between 55 and 80° year-round, protecting temperature-sensitive items from extreme heat and cold. Climate-controlled units come in sizes 5x5 to 20x20. Need to store a vehicle in Indianapolis? Extra Space Storage offers 10x10 to 15x30 drive-up units and 10x20 to 11x44 outdoor parking spaces to handle cars, motorcycles, boats, and RVs of all sizes! At Extra Space Storage, we go above and beyond to meet the needs of our customers. Our facility is always clean, well-maintained, and secure, and our friendly, professional staff genuinely cares that you have a positive self storage experience. Contact us today to reserve a storage unit in Indianapolis! Very friendly staff. Greg was willing to go out in the cold and sleet to show me my space without hesitation. For MONTHS, ESS's website has made it impossible to pay your bill online; you have to go to the facility to make a payment. We've told the office staff, EVERY TIME AT THE FACILITY FOR MONTHS, about this problem (and of today, 12/2/18, not only can I NOT pay online, but ESS increased the rent, again!!!!!!!!!!!!)!!!!!! Extra space will always be our 1st choice for storage. Storage units & ground were extremely clean, employees were professional & very accommodating, considering we had a 6 bedroom house, truck & trailer to store. Everything you want in a storage solution. Easy, helpful, friendly, clean and secure. Highly recommend. Awesome service, Maggie and the other rep there were very nice and personable. Easy electronic sign up in a spotless, well cooled office. Storing our RV there. Nice large spaces for easy parking. This is a great place for storage. Also while making arrangements you will come into contact with polite, friendly and knowledgeable employees. I hope you are as impressed as I was and will be! Monthly rental just went up 20%. Seems a little steep considering there is minimal overhead in the storage rental business! It’s not like I got a 20% cost of living or pay raise to cover the additional costs. Merry Christmas anyways! The manager was extremely helpful. She took the time to help me find the perfect space for the best price! Pleasantly surprised and satisfied with the initial inquiry and patience in answering all of our questions. The process was so incredibly easy. Great experience! Super easy online storage reservations and pricing. Uberly, clean storage compound and units. Easy, no-fuss access to the property! Very professional onsite manager. Thank you, Maggie! I was very pleased with ExtraSpace Storage. Obtaining the storage unit was quick and painless. The customer service was top notch. She even called me up a week later to make sure I was satisfied. I was impressed. An EXCELLENT experience all across the board. . .customer service, convenience, economical cost, ETC! It was getting close to closing and I was graciously helped by Matthew who set me up with a storage unit in about 20 minutes as promised; 15 minutes earlier, I was turned away by a local competitor because she told me it was almost time for their business to close. On another day, I was promptly and pleasantly greeted by Ethan when I entered the door to ask a question. From I-465 and Michigan Road, head south. Turn right on 86th street; there is a Shell gas station on the corner. Continue on 86th street for three quarters of a mile. Turn left on Georgetown road. There is a Planned Parenthood and large billboard at this intersection. Continue on Georgetown road for about a mile. You will pass a Goodwill Outlet on the left and a Dr. Pepper warehouse on the right. We are located next to Indy Stars Gymnastics on the left. You to get to 79th Street or the train tracks, you have gone too far. From I-465 and 71s street, head east. Turn left on Georgetown road after the Kroger. There is a Marco’s pizza on one corner, and a Marathon Gas station on the other. Continue on Georgetown road for 1 and a quarter miles. After the left lane ends you will pass train tracker. Be careful, these train tracks are rough. We are located on the left just north of 79th street next to Indy Stars Gymnastics. If you get to the Goodwill Outlet, you’ve gone too far.